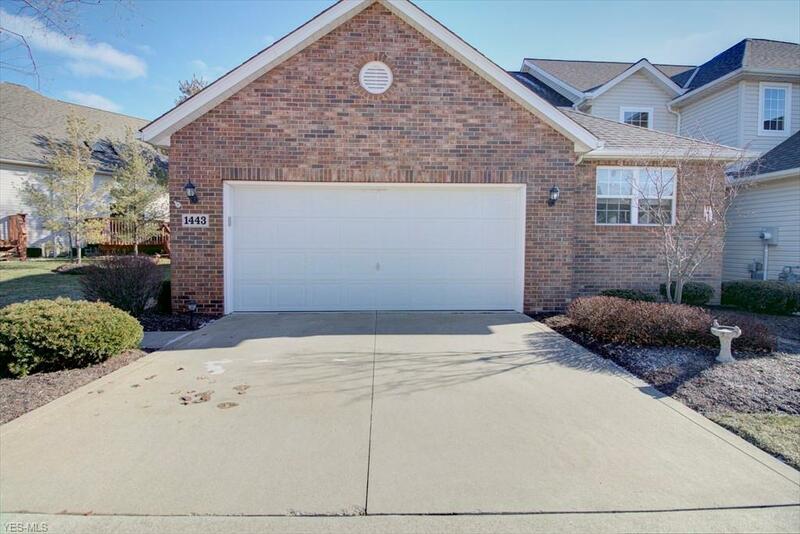 Beautiful cluster home in The Links features lovely hardwood floors in the living room and formal dining area and has a cozy gas burning fireplace. With a very open, spacious floor plan and loads of natural light, this well-maintained home won't last! The large first floor master features an en-suite bath with both a garden tub and shower and the generously sized upstairs bedroom also has a full bath. The eat-in kitchen has an abundance of storage with beaufitul cabinetry, a built-in microwave, dishwasher and stainless steel refrigerator. There is a convenient first floor laundry and half bath, as well. The basement is a great space for entertaining, a home office and family room or game room and includes the 4th bath. This home has a lot of closet space and a huge space in the basement for storage. Within the last two years additions include a hot water tank, sump pump, garbage disposal and approximately 4 years ago a new roof was installed. This home is an end unit with a patio out back and view of the pond, green space next to it and additional parking, making it one of the most desirable units on Spyglass Hill. Set up your viewing today!